Most of the spots I could think of for GNR status were just recently introduced as their own threads on LTH so I figured I'd let those gain some thoughts and wait a year or two on nominations. Which all things considered is short compared to this years nomination. The original thread goes back to 2004. While perusing my mind for a place that defined my definition of a GNR I decided Pollo Vagabundo was getting this years call. Chicago is, imo, still somewhat underrated for Mexican food on not just a national level but in some cases locally. Bringing more attention to a place like this can only increase the areas reputation as a hotbed for not just modern Mexican but also the regional mom and pop spots. Pollo Vagabondo specializes in Norteno Mexican cuisine which is much less common in these parts than the food of Jalisco and Michoacán. This means grilled meats in wonderful handmade flour tortillas that are still warm from cooking thru. And in the case of PV it also means one of the most magnificent salsa bars in the world. In a Reader article by the always reliable Mike Sula it mentions that, Carlos Payan, the owner, makes up to 14 different kinds for customers to enjoy with their grilled chicken which is always well marinated and nicely grilled. You can also enjoy them with tacos, quesadillas, gorditas, fajita platters, and whatever else is on your plate that visit. Its all made with a bit extra attention and lots of care. I'm always a happy man when the opportunity to eat there presents itself and agree with the Reader article headline which states "Mexican Worth the Trek" as I've made the ride out to Northlake on an off day. Vital Information wrote: Somehow this place had escaped my attention until yesterday, but as soon as I read this whole thread, I knew where I needed to go for lunch today. Well worth the visit. I just wish I had paid attention earlier. gastro gnome wrote: I think the salsa bar is just outstanding. I've never seen this many varieties (I would count more than a dozen), from a tomatillo-y salsa verde, to a chuny pico de gallo, to creamier poblano-tinged or avocado based sauces. There are also ample chopped limes, cilantro, etc. I assume that many, if not all, of the salsas are made there freshly. My standard order is the half chicken with two sides (I usually rope in a co worker as this is plenty of food). The skin is crisp, the chicken relatively moist, and the bird is well spiced. With the bevy of available embellishments and the freshly-made tortillas, this makes for a great lunch. jane franklin wrote: This overlooked restaurant is my favorite Mexican restaurant. And I wish more people would know about it because it truly is one of the best Mexican places in the Chicagoland area...You can not judge a book by its cover. Jefe wrote: I love Pollo Vagabundo, probably a top 5 Mexican pick for me in Chi-land. As much as I like the chicken, their burritos are my must order. The flaky rich handmade tortillas, judiciously filled with chile-fortified carne deshebrada and just a little beans and requisite onions y cilantro adds up to the best Norteño style burro in town (and maybe my favorite burrito, period). ronnie_suburban wrote: This place is a gem. I've been 3 times in the past couple of months enjoy the place so much that I actually planned a biz lunch meeting here because the person I was meeting lives in Northlake, and had never been. What a great call. This seems to be the year to nominate great chicken places of long standing (see my Evanston Chicken Shack nomination). I fully support this nomination, and expect to get out there for a "chicken refresher" sometime in the next week or so. I heartily concur. This place just keeps dishing out great food. I believe it well worthy of board recognition. Definitely support this nomination for the handmade tortillas alone. I've never had a bad meal at Pollo Vagabundo. Well-made chicken, delicious burritos, and I'd even venture to that say that they make the best quesadilla I've ever had. A sleeper due to geography alone, I reckon. 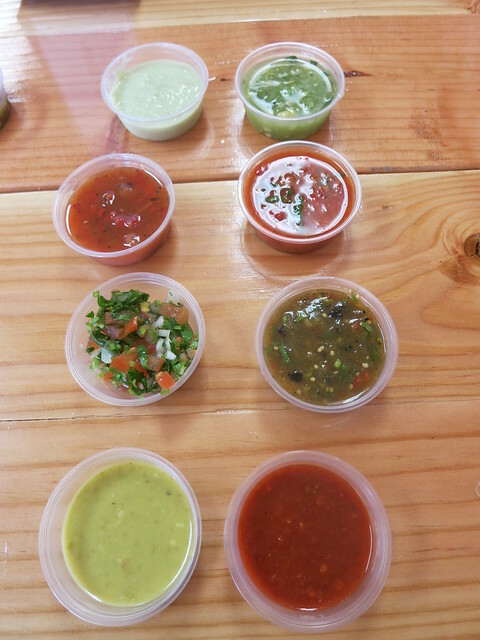 I'm on record with feels for this spot and its magnificent color wheel of salsas. I may enjoy the asada and quesadillas even a bit more than the chicken. I think this is a tremendous nomination! And I'm slightly embarrassed I didn't come up with this one myself, especially as a western burbs transplant. Handmade flour tortillas, yes, the salsas, yes, carne deshebrada, yes, trippy diagonal orange striped paint job, yes! All in on this nomination. The freshly made tortillas are great. Chicken delicious. I think the chicken fajita quesadilla is my favorite thing on the menu. I got in a visit last wee post-nomination and had the deshebrada quesadilla for the first time. Wow. Just wow. I'm glad this place is getting love. It deserves all the praise. I love, love, love this place. As others have posted -- and I am repeating myself here -- this is where I had the best quesadilla I've ever had. Their chicken and salsa bar are also unparallelled. I think this is a great nomination.